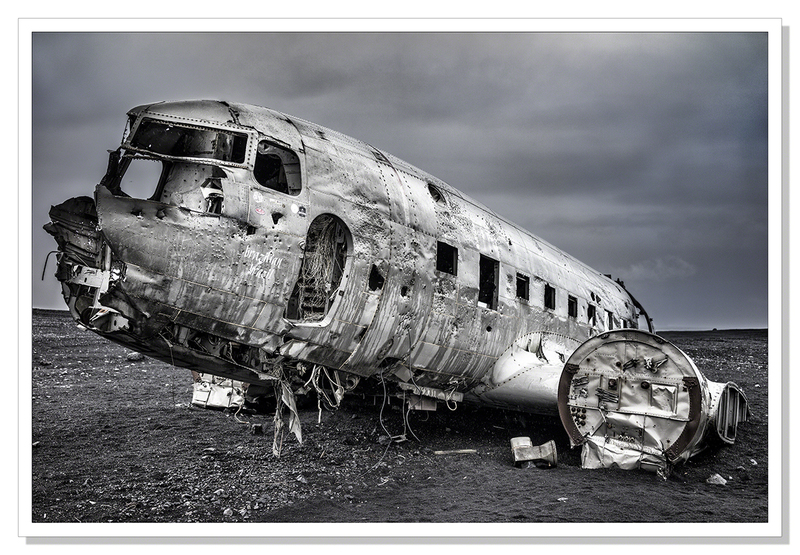 Of Wrecked Planes and Missing Tails..
On November 24th 1973, a US Naval DC-3 Dakota crash landed on the black sands at Sólheimasandur in the south of Iceland. The plane apparently ran out of fuel although it was later discovered that the pilot simply switched over to the wrong fuel tank. How true that is I don’t know. What is a fact is that the plane lies on the beach to this day. 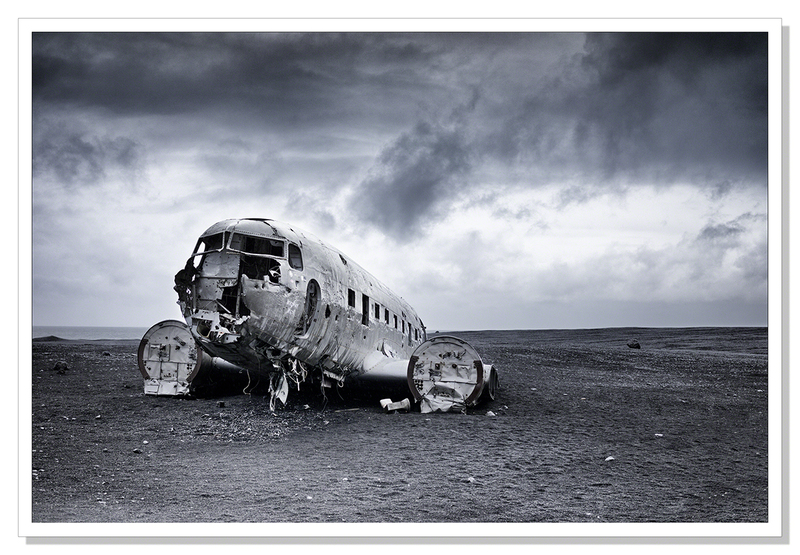 Ravaged by arctic gales and the ferocity of the Icelandic winters the plane, forty years on, is not what it once was. It’s clear that much of the plane has been dismantled and taken away, no doubt recycled and utilised elsewhere. The Icelanders are a very resourceful lot and will recycle anything useful. I read in an article on the wreck in the Daily Mail that stated the tail mysteriously disappeared amid rumours it was stolen by a local farmer to sell it on. I’ll come back to that story in a bit. It’s an interesting place to visit. 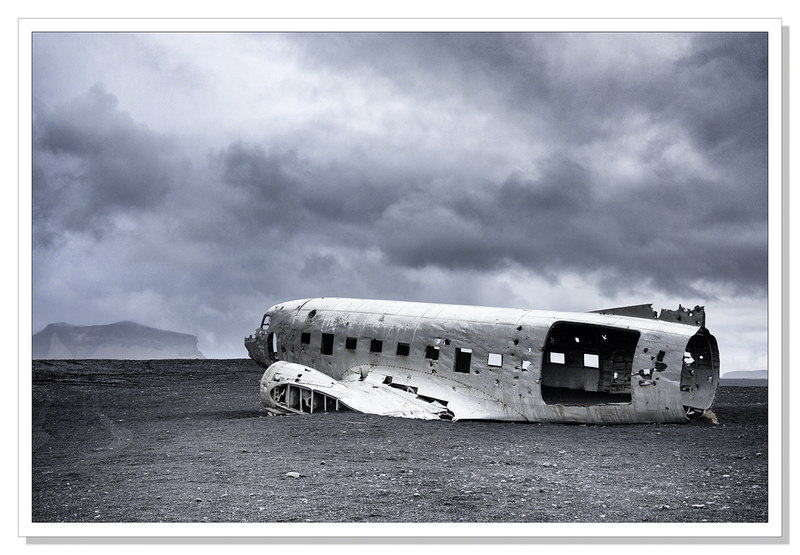 The silver fuselage against the black sand creates a dramatic contrast and on a very wild, rainy and stormy morning, such as it was when I visited, dark brooding skies add to the drama of this apocalyptic scene. While I was photographing the wreck, I spotted movement out of the corner of my eye. Way in the distance on the horizon I saw an arctic fox, curious but ultra shy, I turned my camera in that direction and managed to press the shutter but all I got was a blurry outline. He was gone before I could properly compose and focus of course. The site is popular with photographers naturally. Its location, not a terribly well-kept secret, draws many visitors. I’m sure I’ll return, especially if the northern lights should put in an appearance when I’m passing. I think the wreck will make for some effective foreground interest. This isn’t the only wrecked Dakota in Iceland however. On my recent visit to Höfn, my good friend Runólfur Hauksson, took me to the site of the other wreck. 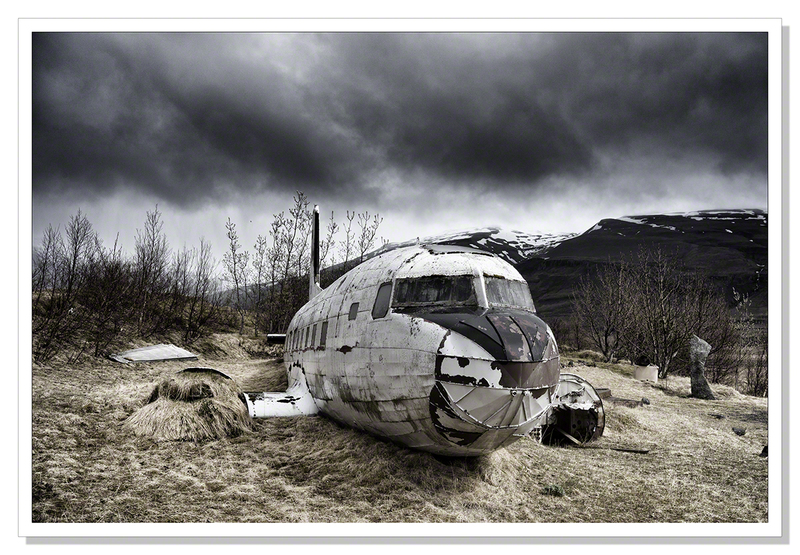 This particular DC-3 crash landed shortly after take off from Höfn airfield and lost its tail in the process. It was similarly abandoned by the US Navy, where it landed. The owner of the land where the plane crashed decided he wanted a more complete wreck than the one he had on his hands. In negotiation with the owner of the land at Sólheimasandur, he bought the tail from the wreck on the sand, dismantled it and carried it back to east Iceland on a trailer where it sits to this day. No stealing involved. After all, if the US Navy didn’t want the planes, it seems entirely appropriate that title should pass to the owners of the land, to do with what they will. I’ll be keeping the location of this other wreck under my hat I think.. :-) Click on any of the images below for a clearer, sharper view. And the other Dakota, complete with tail.. This entry was posted on May 31, 2015 by Chillbrook. 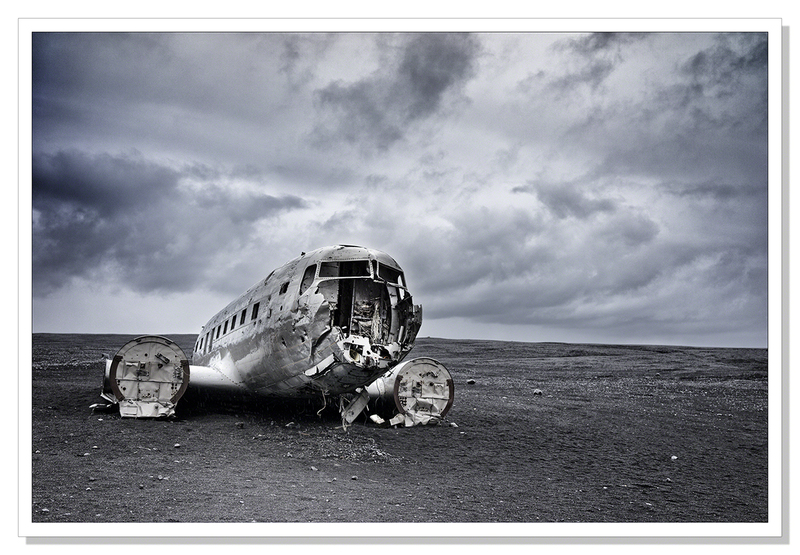 It was filed under Photography, Photography and Travel and was tagged with Adrian Theze, Cornwall Photographic, Crashed Dakota Sólheimasandur, Crashed DC-3, Crashed DC-3 Sólheimasandur, Iceland, Sólheimasandur. Amazing! Fantastic images, and what a story. That plane could be turned into a camper. And who among us remains the same, 40 years on. Thank you Mike! I’m cetainly not, that’s for sure. I think the owner of the second plane had plans to turn the plane into a very unique coffee shop but that didn’t really work out. It’s a bit off the beaten track. A business without customers is never a good thing. It seems there is enough of it left to clean out the inside and put in whatever you want. Sink, bed, computer space. Those are some crisp and dramatic images. You sure do some great work Adrian. Wow, fantastic subjects and brilliant images as ever! A tail well told, if not photographed. Very nice processing, as well. Thanks Emilio! Appreciate your pun as well as your comment! Looks like the perfect dreary sort of day for this sort of shot. Well done, as usual! Good timing! Or beloved of the weather gods. One of my favourite aircraft. Even in this condition they still look amazing. The contrast in the images is superb. I like Mike’s idea of turning the aircraft into a camper. Thank you Simon. The Dakota was a great little aircraft. Definitely something about them. I like Mike’s idea too Simon. I’m not sure what the owners plans are. It certainly deserves to be preserved. Thanks Gin. It’ll be one of those occasions where luck will play a big part but it would be nice to get the image. Great subjects, great images, and great drama in the images – and the next but last photo looks really 3D. I like the clouds, it makes the picture look like the plane crash just happened. Gorgeous. !Fantastic photoshoot of the crasted plane. These really are ravaged wrecks – the photos really pick up the details. Thank you very much Norma! The weather was certainly working in my favour I think. Ghosts with empty staring eye sockets! The glint of whitish metal on black sand against a stormy sky makes a great combination, Adrian. Thanks Andy! This was a sad and sorry sight to me, a bit of an aircraft nut, and I hoped to reflect that through the photographs I took, the angles taken, and the processing of course. Great subject again! I particularly like your second image; the apocalyptic sky and wreck work really well together. Interesting photographs… but a little sad for me. Thank you Shimon. I love aeroplanes and to see these Dakotas, such a great plane, in this state saddens me also. I hoped to reflect my feelings through the photographs I took and my processing of them. Fascinating story Adrian and wonderful images. The last image, for me, goes beyond the others because the wreck takes on an almost animal -like quality, huddled and fearful and miserable somehow but also snug in its space. You always do a professional job, with words and of course, images. Thank you very much Indeed Joshi! A fascinating series and perfect images! Great! Amazing story. And a great images. I love the contrast between the metal gloss and shinny airplanes against the dramatic Icelandic landscape. I *love* these photos!! Super captures and post processing, Adrian! Thank you Camilla! The plane really was a fun subject to photograph. Compelling shots, Adrian! Each and every one. These are amazing. Great mood and outstanding clarity.